Local mental health counselor Peggy Farah recently found herself doing an art rotation as a parent volunteer at the Maplewood Parent Co-op. It seemed like an unlikely fit for her, but she took to it with enthusiasm and found it so interesting, that earlier this year she enrolled at ArtWorks in an art journaling class led by artist Karen Dawn. ArtWorks, managed by the amazing Meredith Arnold, is one of the many wonderful community resources made possible by the Edmonds Arts Festival and its foundation. Its stated mission is to help make visual arts accessible to the entire Edmonds community. To that end, numerous classes, workshops, open studio access and artist gatherings take place there each month. It’s also available to rent for art related activities and parties. Most artists and craftspeople can probably identify with the following — you find yourself deeply engaged and working out the details of your piece. You’re smack in the middle of doing the laborious part of actually making the art. Every stroke counts. You’re in the zone. You become aware of a feeling that it’s not at all about the finished product, but the process itself. It might occur to you in this moment, that you’ve arrived at a lucidity, a calm, a peace that you rarely experience. It’s a beautiful part of the process of making art. In that moment, you seem to transcend time, your world becomes very much about you and the work in front of you. Arriving at this place is a gift. It provides energy and self-awareness. In some ways, it’s similar to the feeling you attain from running or swimming long-distances, or through meditation. Maybe you have to experience it yourself to truly understand what I’m talking about, but I think many readers will get it. As a therapist, Farah believes that this intersection of meditation and art process can be an opportunity to grow and to heal. She’s decided to blend art creation with several of the other therapeutic tools she uses, to create a monthly woman’s retreat at ArtWork she’s calling Release. I’d sign up myself, but my beard’s a dead giveaway. Among her many accomplishments, Farah — who has a masters degree from St. Stevens College — was a featured speaker before 10,000 attendees at Oprah’s The Life You Want event at Key Arena back in 2014. She’s been in private practice for about five years now, and her website indicates that some of her specialties are women’s issues, self esteem, and co-dependency. She’s got an office right here on Main Street. She’s collaborating with Dawn, which provides the advantage of combining an art instructor with a trained therapist — skilled facilitators in both the art and therapy spheres, enabling participants to reach deeper and also reflect on, and process, what they reach. The retreat will combine “mindfulness instruction, directed individual reflection through journal prompts, soul driven art creation, facilitated therapeutic group process, and guided meditation. I’m hoping to bring together a community of like-minded soulful women who are ready to dig deeper, let go of what is no longer serving them and move into their most powerful life,” Farah said. Farah loves the ArtWorks space at 2nd and Dayton, since it has both the local community vibe and plenty of room for both the group, and individual elements of the retreat, which is open to artists, aspiring artists, and those who identify as non-artists. She’s aiming for eight to 16 participants each month. She’s excited to see young, middle-aged and retired women signing up. “There’s something here that will touch women in any stage or phase of life,” she said. Each month is a separate registration, so there’s no requirement to commit to more than a month at a time, but it’s perfectly fine if women should decide to make the retreat part of their monthly routine. Farah’s first Friday retreat is scheduled for March 23. I’m happy to report about an exciting new development here at My Edmonds News. Our new Eat Play Live page will focus the best goings-on and big news of food, drink, art and performance in one place for your convenience. Restaurant News writer Kathy Passage and I will be submitting recommendations to our editor to create a “one-stop shop” for events and activities that will make that “what do you want to do?” decision just a little easier. Shout out to restaurants and bars – do you have an event/performer you’d like to be included? Shoot me an email at [email protected]. Aldo López-Gavilán joins Harlem Quartet. Cuban piano prodigy Aldo López-Gavilán joins the Harlem Quartet in this dynamic cross-cultural collaboration. The program will consist of Latin jazz and classical repertoire, as well as original compositions by Mr. López-Gavilán. An exclusive first look at the forthcoming documentary feature Los Hermanos/The Brothers, followed by a Q&A with Ilmar Gavilan, Aldo López-Gavilán and the film’s director Ken Schneider. Born in Havana, these virtuoso musicians are brothers — long separated by geopolitics. Ilmar left for Moscow at fourteen, sent by the Ministry of Culture to study classical violin with a Soviet master after he outgrew his Cuban teachers. He never lived in Cuba again, ultimately landing as a hard working musician in the U.S. Younger brother Aldo grew up mentored by Cuba’s impressive jazz and classical pianists, his extraordinary talent easily achieving renown on the island but stymied from attaining wider fame by the U.S. embargo. He too left Cuba — for the London Conservatory — but returned to his home country to make a life. After 30 years, a thaw in U.S.-Cuba relations offers the brothers the opportunity of a U.S. concert tour together. But just as they hit their stride, Fidel Castro dies and Donald Trump is elected, threatening the future of their dreams. Raised in the Puget Sound region and a former resident of Seattle, Jamie Ford is the author of three fictional novels set in Seattle and the city’s International District. His 2009 debut novel, Hotel on The Corner of Bitter and Sweet (Ballantine Books) received numerous accolades. His following novels, Songs of Willow Frost (2013) and the recently published Love and Other Consolation Prizes follow in the author’s canon of the journey of the human spirit set against a historical Seattle backdrop. Sponsored jointly by the Edmonds Library, the Friends of the Library, and the City of Edmonds Arts Commission. Admission is free. Support award-winning programs as the Edmonds- Woodway High School Music Boosters prepares for their annual music gala at The Nile Country Club. An evening of dinner, games, the excitement of both a silent and live auction, plus the performances from our talented young musicians will ensure that a wonderful time will be had by all. Juried by noted Seattle artist Barbara Noonan, this year’s show features 175 paintings by 75 artists from 10 states. In addition to the artists’ reception and awards presentation, an Art Walk Edmonds Third Thursday event will be held March 15, from 5 to 8 p.m.
Rossini’s Overture to the Journey To Reims and Brahms’ Concerto for Violin and Cello in A minor are on the program. Juilliard-trained Mae Lin grew up in Bellevue and plays in the first violin section of the Seattle Symphony. Cellist Eric Han has been performing with major orchestras since the age of 14. Han also plays with the Seattle Symphony and is principal cellist with the Seattle Opera. Don’t forget to attend the pre-concert lecture at 6:30 p.m. by KING-FM’s Dave Beck, who will preview the evening’s musical pieces. Thursday, March 15 – 7 p.m.
Saturday, March 17 – 2 & 7 p.m.
Sunday, March 18 – 2 (DHH) & 6 p.m.
James and the Giant Peach is a magical musical full of amazing adventure and unexpected friends, written by beloved author Roald Dahl (Charlie and the Chocolate Factory, Matilda). Join MCT’s production of a young orphan named James who accidentally drops magic crystals by an old peach tree. Strange things start to happen and James soon discovers a magical world full of friendly insects and learns that love and family can be found in unexpected and unusual places. Performed in the beautiful MTHS Theatre, an enormous 30-piece live orchestra, intricate costumes, professional quality sets, and 100-plus students turn this school musical into an extravaganza. Our information suggests that tickets will be available at Brown Paper Tickets until 3/11, and at door with cash or check one hour before performance thereafter. Subject to availability. Jazz vocalist and trumpeter Jake Bergevin is often heard fronting his Javatown Swing Orchestra, and is known for his commitment to swinging the Great American Songbook. For the past seventeen years he has been a featured artist at the Ellensburg Jazz in the Valley Festival, and recently was guest vocalist with the Spokane Jazz Orchestra and the Tacoma Symphony. Jake also is a successful music teacher, leading the Edmonds-Woodway High School jazz ensemble five times to New York as finalists in the Essentially Ellington contest. 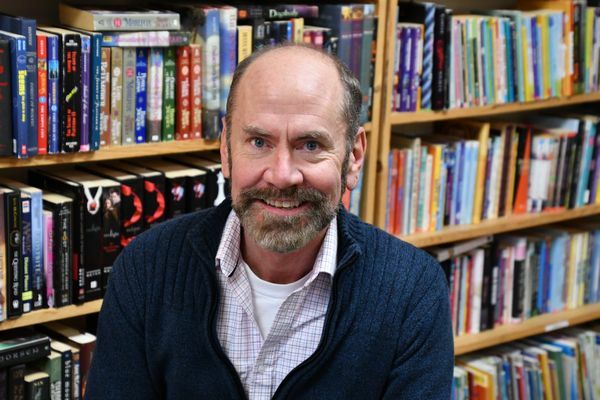 The Edmonds Bookshop welcomes back one of their favorite local authors. Join them for the always festive Third Thursday evening, complete with snacks and beverages. The Coronation Mass received its nickname after it became the preferred music for royal and imperial coronations in the imperial court of Vienna. 410 N. 4th Ave. N.
Arrive early at 5:45 p.m. for happy hour before the performance. White Swanson Taffeta Flagging Tape and the chain link fence are the fabric structure for this cross-stitch design. The theme of the installation is community. “There is a lot of noise in the media these days trying to divide us,” says Lally-Chiu of her work, “in response we need to send a strong message of what ties us together.” A commercial designer and artist working primarily in watercolor and linocut, Lally-Chiu has shown her artwork in a number of group and solo shows. From left, artists Mona T Smiley Fairbanks and Lisa Wickstrom. Rhizome Cuff is the fourth collaborative On the Fence installation for Mona T. Smiley Fairbanks and Lisa Wickstrom. The artwork is intended to inspire a conversation about nature, community connections, recycled materials and the endless delights of art. Mixing reclaimed aluminum flashing and colored vinyl, the artists created a three-dimensional, organically flowing rhizome form—a continuously growing horizontal underground stem that puts out lateral shoots and adventitious roots at various intervals. Fairbanks and Wickstrom’s inspiration for the piece was the vinyl, noticing the how the vinyl material looked rolled up and standing on-end. The Edmonds Arts Commission seeks artists to create temporary artworks for the on the fence program. For application information visit www.edmondsartscommission.org or call 425-771-0228. Artists of all disciplines, and at any stage in their career, will learn the basics of writing successful artist statements and resumes. By the end of the workshop, attendees will have the start of a resume and statement to use on their website, portfolio, or for grant, residency, or fellowship applications. Ethereal Windows by Tracy Felix. Portals is an apt descriptor of Felix’s large, vivid, geometric focused color field paintings. Works that seek to draw the viewer into the spaces inhabited by her ethereal, atmospheric effects.